Esther Wojcicki, known as “Woj” to her students, has never been interested in convention. So, when she left a career in newspapers to teach journalism at California’s Palo Alto High School in 1984, one of the first things she did was to discard all of the traditional text books in her classroom. Since then her thought leadership on education as well as its intersection with technology has not only transformed the school where she still teaches, it has succeeded in grabbing global attention. 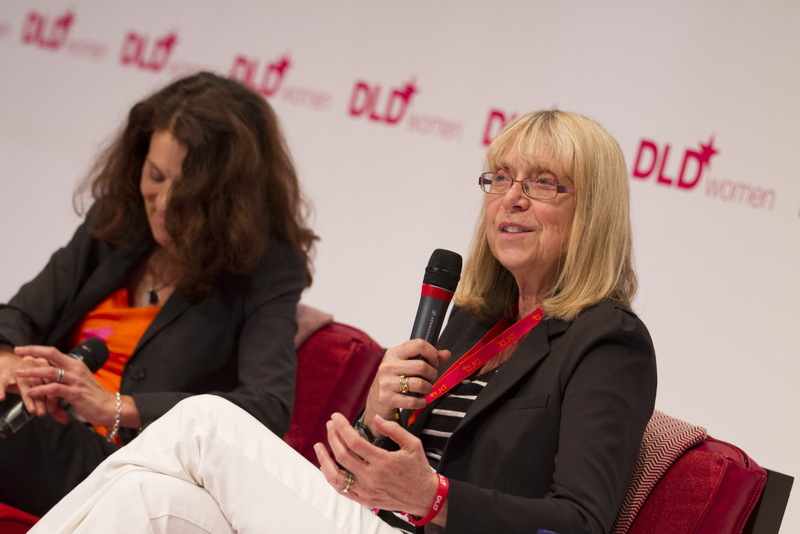 Wojcicki, a speaker at DLDwomen, is credited with building Palo Alto High’s journalism program from a small group of 20 students in 1985 to one of the largest in the nation with 600 students and six electives, including three magazines, two television shows, one website and one video production class. Over the past 20 years, the publications have won Gold and Silver Crowns from Columbia Scholastic Press Association, the PaceMaker Award and Hall of Fame Award from National Scholastic Press, and best in nation from Time Magazine in 2003. That’s not all: the school’s online magazine was honored with two Webby Awards in 2005. All of this has earned Wojcicki a number of teaching awards. Most recently she was honored nationally on the U.S.'s Digital Learning Day, as one of a small group of "great teachers" who use technology effectively in the classroom. Wojcicki may have inspired students like Epstein but she is not content with training the next generation of journalists. Her aim is to create better students. Her thesis – one she shared with an international audience at a June education conference at the Paris-based Organization for Economic Cooperation and Development – is that journalism skills can be used to teach students to think more clearly and do better in a variety of subjects. “Journalism can be an umbrella for learning everything including spelling, grammar, concise writing, interviewing, statistics, ethics and civic engagement,” Wojcicki said in an interview with Informilo. Interest in her approach to education led to a recent invitation by the Academy of Singapore Teachers to be part of the Outstanding Educator in Residence program. Under the program renowned educators from around the world are invited to spend several weeks in Singapore lecturing to Singapore educators. Wojcicki’s ties to Google run deep. Her daughter Susan and husband Dennis bought a house in nearby Menlo Park soon after they were married. They needed to sublet rooms in the house to make the mortgage. The tenants were Sergey Brin and Larry Page and they famously ended up starting Google in Susan’s house. Susan, who was working at Intel, joined Google in 1999 as the company's first marketing manager. TodaySusan is senior vice president of advertising at Google, where she is responsible for the design and innovation of all of Google's advertising and measurement platform products, including AdWords, AdSense, DoubleClick, and Google Analytics. Invites to Paris and Singapore are not the norm for most U.S. high school teachers, but then again Wojcicki is anything but ordinary. The daughter of Russian immigrants,Wojcicki, whose maiden name is Hochman, was valedictorian of her high school class and went on to become the first person in her family to earn a college degree. She graduated from UC Berkeley with a B.A. in English and Political Science; she also received a secondary teaching credential from UC Berkeley, as well as a graduate degree from the Graduate School of Journalism at Berkeley. She also has an advanced degree in French and French history from the Sorbonne, and both a Secondary School Administrative Credential and an M.A. in Educational Technology from San Jose State University. The close proximity to Google’s founders had other consequences: daughter Anne, an investment banker-turned-entrepreneur focused on health, ended up marrying Brin. These qualities and her expertise led to her involvement with University of the People. “I asked Esther to be a member of the advisory board because she has vast experience in the intersection of technology and education and openness – she is one of the leaders of the open educational resources movement,” says Shai Reshef, UoPeople’s founder. There is a shift in thinking that needs to take place to change classrooms both online and offline, says Wojcicki. Teaching journalism can play a role in making learning more interactive and effective. But teachers also have to continuously embrace and evaluate new technologies and adapt their classrooms accordingly, instead of relying on outdated skill sets. And if they don’t want to become invisible and irrelevant they will need to be open to sharing their course materials online, helping to democratize education. Thanks in part to Wojcicki, these messages are now being heard far beyond the corridors of Palo Alto High. • Dimension U, a web-based interactive gaming platform and learning resource created by Nt Etuk, a native of Nigeria, helps students from kindergarten through high school hone their math and literary skills. Students use the platform to access 3D multi-player educational video games which connect them with friends and allow them to compete and collaborate while learning. The U.S. company works directly with schools and has built up an audience of just under a million students in the U.S.
• Quipper, an e-learning start-up created by Japanese entrepreneur Masa Wannabe with financial backing from Atomico, the London-based international technology venture capital firm, offers an app platform for teachers to create their own quiz programs. Quipper's quizzes cover more than 2,000 topics, such as math and physics, and languages ranging from Dutch to Turkish, and can be accessed via Apple and Android smartphones. • Piazza, created by entrepreneur Pooja Sankar, is a free online gathering place where students can ask and answer questions 24/7, under the guidance of their instructor. Anyone can create a class at Piazza.com to initiate class discussion. Students spend on average four hours a night on Piazza working together in real time with classmates and instructors to find the answers they need at the time they need them. Campuses across North America, including Stanford, Berkeley, MIT, Cornell, Harvard, Columbia and Princeton, are using Piazza. • Time To Know, an Israeli start-up, is building a common operating system and digital core curriculum for schools, radically changing the way teachers and students interact. The company has raised $60 million in funding thanks to one of its backers, Shmuel Meitar, a co-founder of Amdocs, a global customer care and billing software company. Some100 schools are currently working with Time To Know in Israel and 50 more are under construction and will start to operate next year. Its technology has also been adopted in schools in New York City and Texas in the U.S. and in France and South Korea. Most recently it has forged a joint venture with a majorbooks publisher based around a unique technology and methodology it has developed to quickly and effectively convert print books to an interactive learning environment. The companyintends to expand globally through partnerships with leading publishers and islooking for key partners in Europe and Asia. This article is one of 11 appearing in a DLD Informilo special edition print magazine that has been distributed at the DLDwomen conference in Munich July 11-12, 2012. "The Weather Channel is changing the Climate Change Discussion"